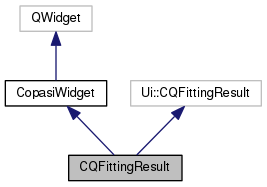 Definition at line 30 of file CQFittingResult.h. Definition at line 43 of file CQFittingResult.cpp. Definition at line 54 of file CQFittingResult.cpp. Definition at line 84 of file CQFittingResult.cpp. References C_FLOAT64, FROM_UTF8, COptProblem::getCalculateStatistics(), CFitProblem::getCorrelations(), CFitProblem::getCrossValidationSet(), CCopasiRootContainer::getDatamodelList(), CCopasiDataModel::getDataObject(), CExperimentSet::getDependentErrorMean(), CExperimentSet::getDependentErrorMeanSD(), CExperimentSet::getDependentObjectiveValues(), CExperimentSet::getDependentObjects(), CExperimentSet::getDependentRMS(), CExperiment::getErrorMean(), CExperiment::getErrorMeanSD(), CFitProblem::getExperiementSet(), CExperimentSet::getExperiment(), CExperimentSet::getExperimentCount(), CFitProblem::getFisherInformation(), CFitProblem::getFisherInformationEigenvalues(), CFitProblem::getFisherInformationEigenvectors(), COptProblem::getFunctionEvaluations(), COptItem::getLastStartValue(), COptItem::getLowerBound(), COptItem::getLowerBoundValue(), CCopasiObject::getObjectDisplayName(), CExperiment::getObjectiveValue(), CCopasiObject::getObjectName(), COptProblem::getOptItemList(), CCopasiTask::getProblem(), CExperiment::getRMS(), CFitProblem::getScaledFisherInformation(), CFitProblem::getScaledFisherInformationEigenvalues(), CFitProblem::getScaledFisherInformationEigenvectors(), COptProblem::getSolutionVariables(), CCopasiDataModel::getTaskList(), COptItem::getUpperBound(), COptItem::getUpperBoundValue(), COptProblem::getVariableGradients(), CFitProblem::getVariableStdDeviations(), mpProblem, mpTask, and CVectorCore< CType >::size(). Definition at line 59 of file CQFittingResult.cpp. Definition at line 78 of file CQFittingResult.cpp. Definition at line 392 of file CQFittingResult.cpp. 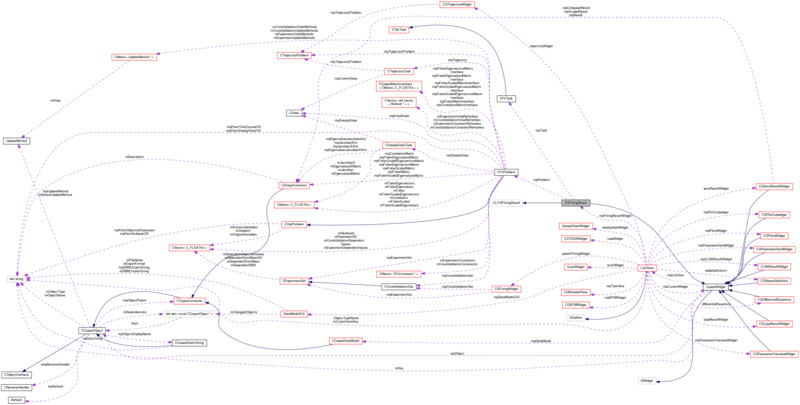 References C_FLOAT64, C_INT32, checkSelection(), CLocaleString::fromUtf8(), CFitProblem::getCorrelations(), COptProblem::getExecutionTime(), CFitProblem::getFisherInformation(), CFitProblem::getFisherInformationEigenvalues(), CFitProblem::getFisherInformationEigenvectors(), COptProblem::getFunctionEvaluations(), CFitProblem::getRMS(), CopasiFileDialog::getSaveFileName(), CFitProblem::getScaledFisherInformation(), CFitProblem::getScaledFisherInformationEigenvalues(), CFitProblem::getScaledFisherInformationEigenvectors(), COptProblem::getSolutionValue(), CFitProblem::getStdDeviation(), mpProblem, and TO_UTF8. Definition at line 567 of file CQFittingResult.cpp. Definition at line 70 of file CQFittingResult.cpp. Definition at line 48 of file CQFittingResult.h. Definition at line 47 of file CQFittingResult.h.